THE GAME HAS CLOSED. FINAL DATE TO CLAIM PRIZES IS 4/12/2020. 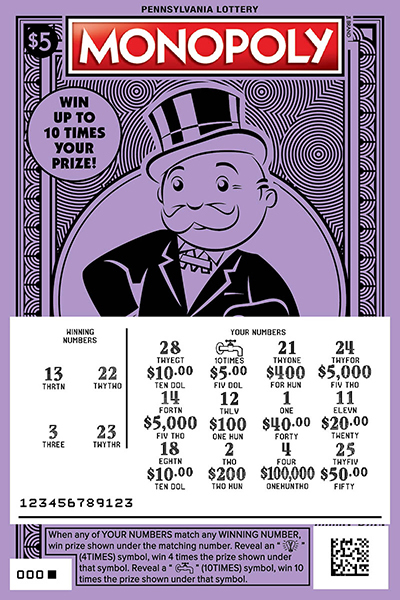 $5 MONOPOLY™ is a $5 game that offers 10 top prizes of $100,000. 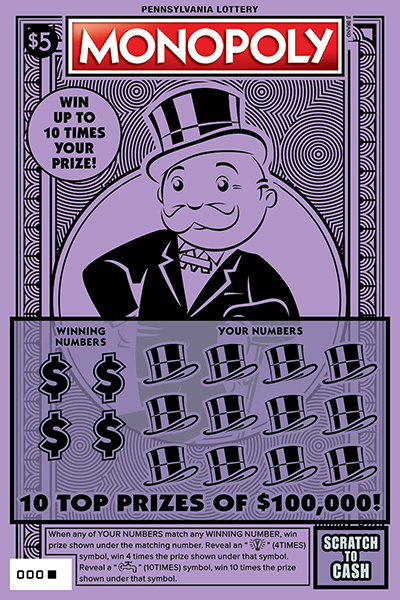 When any of YOUR NUMBERS match any WINNING NUMBER, win prize shown under the matching number. Reveal an "ELECTRIC COMPANY" (4TIMES) symbol, win 4 times the prize shown under that symbol. Reveal a "WATER WORKS" (10TIMES) symbol, win 10 times the prize shown under that symbol. MONOPOLY © 1935, 2018 Hasbro. All Rights Reserved. Licensed by Hasbro.